Egypt's former presidential candidate Abdel-Moneim Abul-Fotouh won uncontested elections on Friday to retain his position as the head of Strong Egypt Party, which he founded in July 2012. 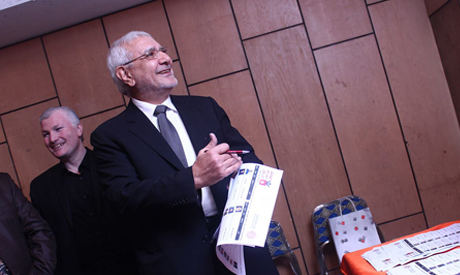 Ahmed Fawzy, who ran on the same electoral list as Abul-Fotouh, won the position of the party's general secretary. This was the first Strong Egypt Party elections since its foundation. In the elections, 88 people were also competing for 49 seats in the party's high board. The party managed to find a venue for its elections in Cairo's Al-Abbasiya district, after contemplating in late 2014 to hold the meetings in the streets, after a number of hotels and public conference rooms shunned them. Strong Egypt Party announced earlier that it would not run for the upcoming parliamentary elections, scheduled to take place over two stages in March and April. The Party cited "lack of political conditions that would guarantee real competitive elections." The Party is known for its opposition towards the current government. Although Strong Egypt Party opposed president Mohamed Morsi, and called for his resignation or for early presidential elections, they still denounced his ouster in July 2013 and dubbed it a "coup." Abul-Fotouh was a strong contender in the 2012 presidential elections. He served in the guidance office of the Muslim Brotherhood, the same group from where Morsi hails, from 1987 to 2009. His departure from the Brotherhood was believed by some to be an internal mini-coup by hardliners against the reformist and moderate faction he represented.